Earlier today, Nintendo announced that Yo-kai Watch 3 is releasing on December 7 in Europe. Alongside the news, we have a look at the boxart above. Continue on below for a bunch of details about the game as well. 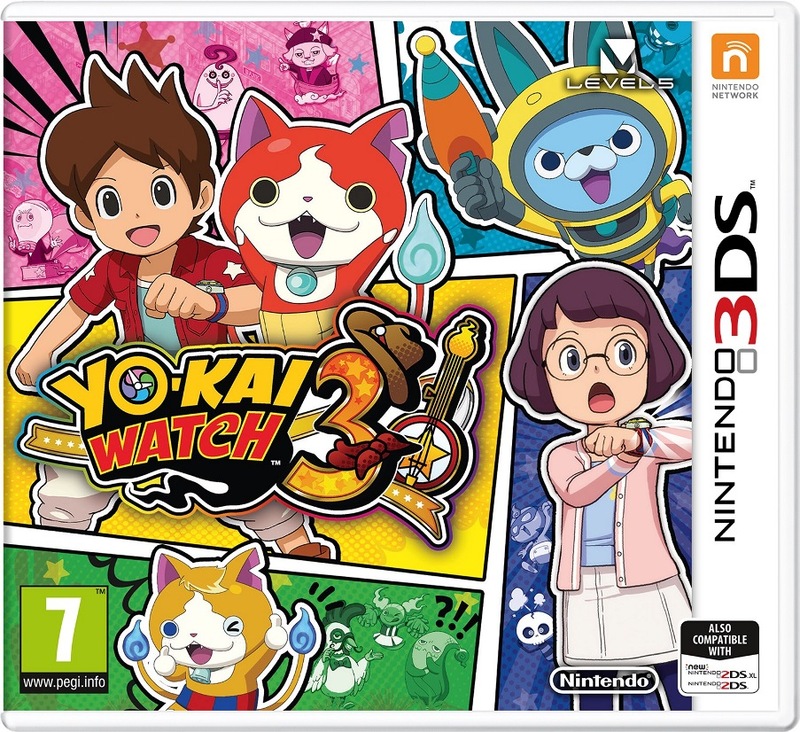 Explore beautifully designed environments, befriend mischievous Yo-kai and join Nate and Hailey Anne on an epic adventure as they attempt to solve the sudden mysterious phenomena surrounding their home-towns, when YO-KAI WATCH 3 inspirits Nintendo 3DS family systems on 7th December in Europe. With the first YO-KAI WATCH game and its popular sequel YO-KAI WATCH 2 capturing the imaginations of children across Europe, fans of the games and the popular TV series can now enjoy an all-new story, befriend old and new quirky Yo-kai and experience a revamped battle system. Players who are eager to test their battle skills against fellow Yo-kai rivals can participate in a range of multiplayer battles including Local Battle, Friend Battle and ‘Merican Dream Battles. In ‘Merican Dream Battle, players can choose between Casual Battle, which has no rules, and Official Rank Battle, where they can battle to gather Rank Points. Outside of the battle arena, players can trade Yo-kai via StreetPass and trade medals over Wi-Fi or local communications. Fans of Jibanyan can get creative with a feature called Build-a-Nyan, where they can design their own cat Yo-kai by giving it a name, changing its colour and selecting which tribe it represents. Collect Originyan parts through the game to change its voice and appearance, and befriend cat Yo-kai along the way to pass their moves onto your customised moggy. By visiting the in-game Post Office, players can present download codes, QR Codes and passwords to the receptionist to redeem special items and Yo-kai. The Crank-a-kai of which Whisper first appeared in the original YO-KAI WATCH game and popular TV series makes a return and this time it can be used to receive more items and Yo-kai. Both Crank-a-kai coins – an in-game currency – and Play Coins, earned by walking around with a Nintendo 3DS family system, can be used as tender. It’s also possible for owners of previous games in the series to link their games with YO-KAI WATCH 3 to unlock in-game content. Link YO-KAI WATCH 2: Bony Spirits, Fleshy Souls and Psychic Specters to befriend an S-Ranking Yo-kai from each game. Players can also link with YO-KAI WATCH BLASTERS: Red Cat Corps and White Dog Squad to unlock an exclusive Yo-kai from each of these titles.